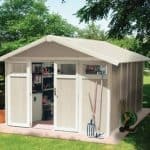 This 7 x 4 plastic shed is compact and incredibly easy to build, so easy that even a novice at DIY will have this up in no time at all. The unit has full UV protection, so you know that it will not suffer from fading or cracking due to prolonged sun exposure. The roof panels allow natural light to fill the shed as it has translucent elements that act as a skylight. The doors are double hinged and high strength, so you also get security as well as quick access. The polyethylene panels which make up the majority of this shed are done in a truly incredibly way. They have been moulded so that the shed has a somewhat barn type of look to it, with a nice brown roof and a large set of double doors that at a glance look like they are made from wood. Inside the shed and making sure you are going to be able to get many years of use out of this is a very strong and secure steel frame that is powder coated so that it fits in with the style of the rest of the shed. This is effortlessly manages to be very attractive and also incredible strong. 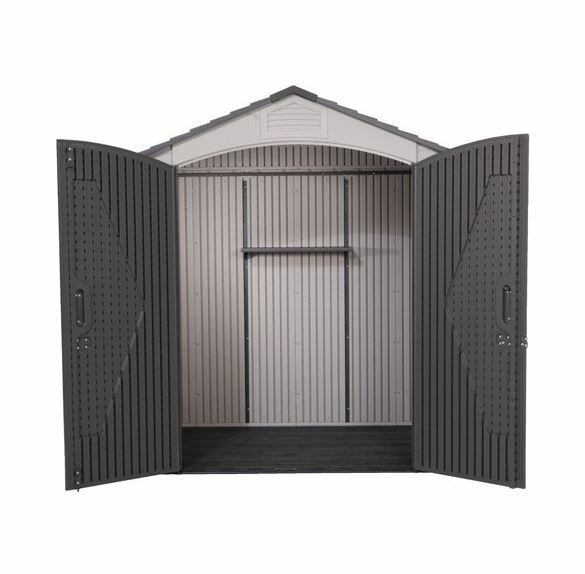 The Lifetime 7 x 4.5 Apex Plastic Shed is another fantastic plastic based shed from Waltons. 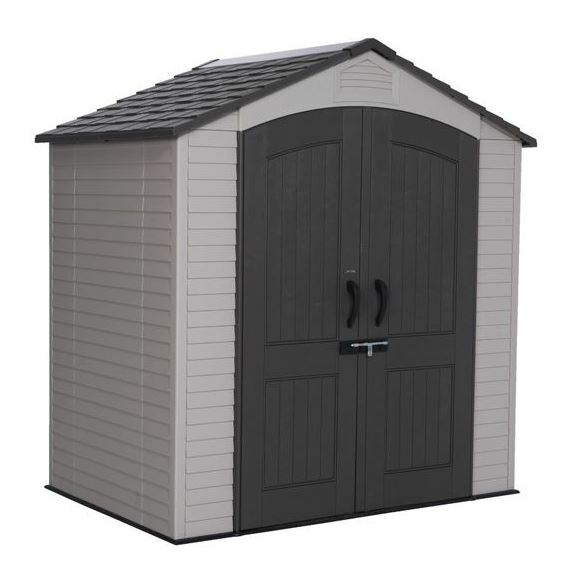 This is a good sized shed that has a very interesting look to it, we feel that it has a somewhat barn or even church building type of look to it, and that it is certainly going to stand out very well in your garden. 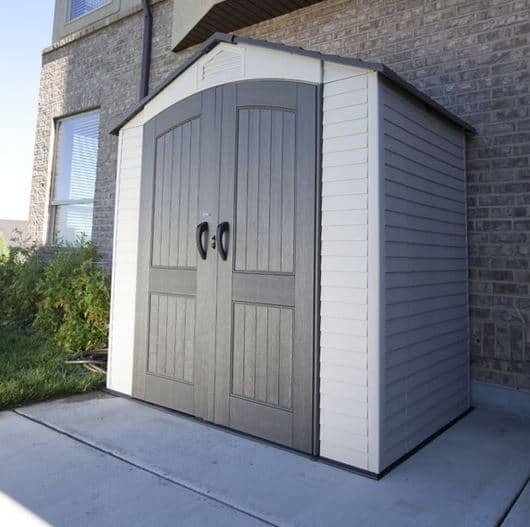 At 6 feet 9 inches wide and 4 feet 7 inches deep this is a shed where you are going to be able to keep all your tools and gardening equipment safe from the rain. 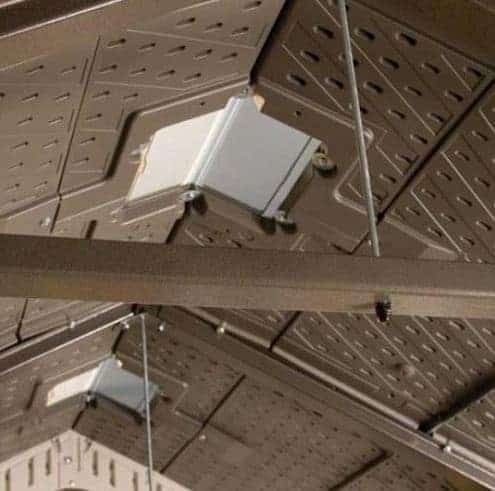 It actually would work very well as a place to throw all the kids summer toys when they are no longer playing with them. To help with your storage the shed actually comes with two shelves which is a great bonus and something we did not expect. There is plenty of headroom inside here with the ridge height being 7 feet 5 inches, even at the eaves there is 5 feet 11 inches of height which is more than what most other sheds offer. The apex roof is nice and high and done in a different colour than the rest of the shed to make it stand out. While it is made with high quality polyethylene panels it has a somewhat slate look to it which we really like. This is one very well made roof that is going to actually let in some natural light and fresh air into the shed. 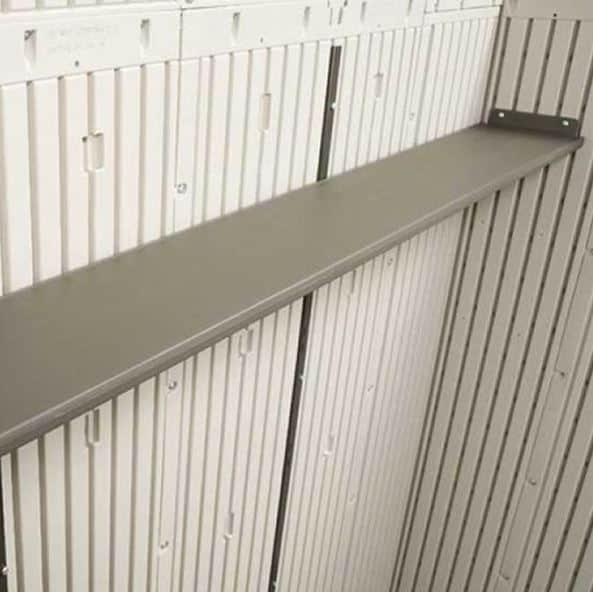 All of the walls are made with these high tech, polyethylene panels. We really love the look of these and we know that to some the idea of a plastic shed may sound weird, but we can assure you this is one fantastic looking shed. It just has such a modern and cool look to it that we feel pretty much everyone is going to love the way this looks. It is not just pretty either as those polyethylene panels are weather resistant and they will not fade over time thanks to being UV resistant. The whole shed is supported with a very strong steel comprised frame that has been powder coated to give it a very sleek look. Now this frame we know does look very thin, but it is also incredibly strong and we are actually very happy that they have managed to use a strong frame that is not big and bulky. 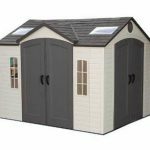 The flooring is actually included with this shed which is awesome as sometimes these plastics sheds do not come with a floor which can be a bit of a hassle to sort out yourself. Like the rest of the shed this is made with polyethylene panels which allow you to install the shed pretty much anywhere you have a flat surface. So you could build this on the grass and the flooring is not going to rot, decay or show any signs of wear and tear. 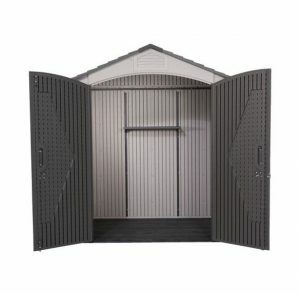 Those of you who are allergic to cleaning are going to love how low maintenance the Lifetime 7 x 4.5 Apex Plastic Shed is. When we say low maintenance we are not joking either. There is no treatment required, no having to protect from rot or anything like that. The most you will ever have to do is give it a wash down with the garden hose and even then that is not something you have to do, but if your other half is getting sick of the dirty, caked in mud shed that is standing in the garden it may be less hassle to clean it than deal with that. There is a very generous ten year manufacturers guarantee that comes with this shed. Due to the impressive polyethylene panels and steel frame work, Waltons are able to give you such an impressive guarantee. On a shed of this, let’s just say more compact size, we would normally expect to see a single door. So we were very pleased to see this, 4 feet 6 inches wide and 6 feet 3 inches high double door on here. This is one very impressive door that is made extra strong thanks to the double hinges used to secure it. 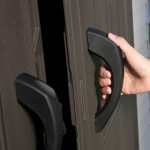 Each door has a large handle to make opening and closing the doors and in general these are very well made and high quality doors that we really like. There are not actual windows on this shed, but the roof does have translucent panels which serve as a skylight and allow natural light into the shed. Also there are a couple of high quality vents that will let in fresh air if things are getting a little bit too hot, sweaty and stinky inside. Those doors close very well and adding something like a chain and padlock would be very easy to do if you wanted to kick your security up a few notches. The overall security provided by the shed is just great as this is one very sturdy and secure structure. We just love how private this shed is there is no way for anyone to see what you have in here unless you leave the doors wide open of course. Even though there are no windows, you still get light and fresh air in the shed, but without having to sacrifice privacy. Due to being made with polyethylene panels there is no way to make any changes to the look of the shed. We actually do not see this as a negative as, Waltons have made sure this is one amazing looking shed as it is. 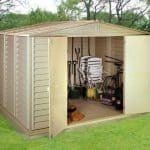 There are no expensive extras that you need to consider when buying this shed, the floor is included in the price and at the most some kind of padlock and chain is all you would need to consider purchasing. Those polyethylene panels and strong steel framework really do make this one very impressive looking and high quality shed. The type of materials that make up this shed are going to not only last for 20 or more years they are also not going to fade or show any signs of wear and tear either. As much as we love this shed, it is one of the smaller sheds on the market, but you do have plenty of height to make use of and those two included shelves will also help you maximise the space. You are not going to have any trouble putting this together as the polyethylene panels will slot together very easily and with the help of a friend, you should have this up and ready for use in just a couple of hours at the most. You are getting a lot of value for your money here. 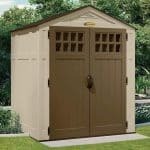 While it may not be huge, you are still getting a very well made shed that is going to give you many years of service. 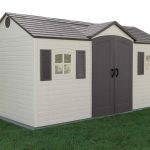 Final Thoughts: With a look that you simply cannot get with a wooden shed, the Lifetime 7 x 4.5 Apex Plastic Shed is one very attractive looking, compact sized shed that just oozes style. We love its modern design and how Waltons have moulded those polyethylene panels so that the roof looks like slate and the door like wood. 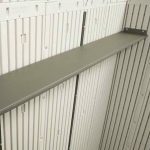 It may not be the largest shed we have ever seen, but we like how the height will allow you to stack things up high and the two included shelves will also help you free up a little bit of floor space. 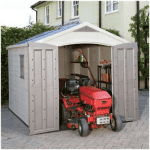 In all this is a shed that we really like and if you want something that is going to last you many years and not require any looking after then this is something we highly recommend.